EXCLUSIVE! On-Set News Report! SPOILER ALERT! 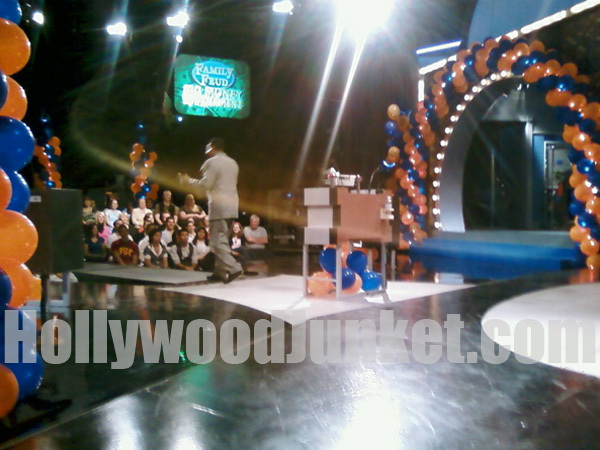 FAMILY FEUD just taped it’s “Big Money Tournament” show yesterday! Seven games were played by past family contestants chosen by the show to play for a potential grand total of $120,000. Host, John O’Hurley stated that the families for this tournament were considered the “best” ones out of last years 165 shows! Yep, they brought the “best” of those families back to play this high stakes game. O’Hurley, nor anyone else from the production of the show mention if “best” was defined by how well the families played in their previous game, or if “best” meant they were the most entertaining in personalities. In either case, neither scenario seemed to uphold. To see John O’Hurley for the first time in person, was like seeing John O’Hurley on TV. He never seemed to break character, even when talking to the audience. However, when one has as a distinctive voice as he, I suppose it would be difficult to determine when he’s being himself. On a professional note, the majority of O’Hurley’s lines on the show are improv. And believe it or not, a lot of hosts have difficulty reading from the teleprompter and must do re-takes. O’Hurley on the other hand, never needed a retake for the entire day of filming, and he was only cued on what to say with cue cards (yes, they still use those). Six games were played by selected families: Teague vs. Anderson; Tripp vs. DeRoux; Hart vs. Sutton; and so on. The winning family of each game had to play the winning family of another game until the final two families were narrowed down to play the seventh and final game. Each regular game was played as usual. Except, at the end of the “Fast Money Round”, if a total of 200 points was scored, $20,000 went to NOT the family playing, but instead, to a “jackpot” in which the final two families played to win. So, if each of the six games played ended with the contestants earning the 200 pts., then the jackpot had the potential of being $120,000. Don’t worry, I won’t reveal how much it actually ended-up being. At the end of the final, seventh “Big Money Tournament” game, there was NO “Fast Money Round” at all. Instead, the two families played until one of them earned 400 points or more. The first family to reach 400 points in the final game, won the jackpot! Orange and blue balloons galore fell upon the stage! My biggest complaint (besides the show announcer’s, quirky personality, who is also the show’s warm-up host) was there was not enough of a build-up to when the winning family was actually winning. Okay, there was NO build-up to the moment when the question was answered that would decide who would win the jackpot. Audience complaints rang throughout the entire time of the tapings of shows in regards to the aggressive manner in which the announcer/warm-up host, Burton Richardson, executed his job in a Nazi-like fashion. Not letting audience members talk when he was talking, not allowing them to use cell phones in between short breaks, and even pointing-out non-clapping and non-smiling audience participants. Such is life on the set of “Family Feud”. On a sweeter note, one of the contestants on the show actually stopped the show to make a marriage proposal to his girlfriend sitting in the audience. Awww! 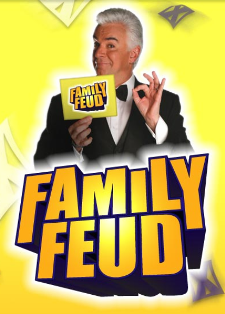 According to the show announcer, Richardson, it was the first time in “Family Feud” history that anyone ever proposed on-stage.